One of the goals of a Realtor program is to increase the number of Realtors promoting the new construction community. The old adage of “out of sight, out of mind” applies. The key to growing a successful Realtor program is continual, consistent engagement and messaging reinforcement. We recommend including this “Realtor Section” for all emails being sent from the company/marketing/sales manager. Encourage each onsite sales agent to include a Realtor section in their emails to Realtors too. The more this message is reinforced, the higher likelihood the Realtor will act on it. A message about how you are going to help the Realtor make more sales. 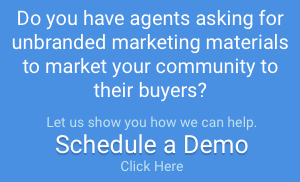 Talk about the agent tools you are providing to the Realtor to help them to easily market the community. Include a call-to-action (CTA) for the Realtor to take the next steps. Below are a few examples. Feel free to use in your own emails. Example 1 is an email blast to Realtors promoting a “Move in Special”. Agents. Easily market Corkscrew Shores to your buyers. 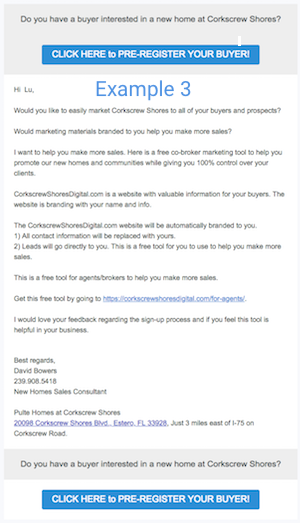 The CorkscrewShoresDigital.com website is a FREE tool that makes it easy for agents to market this project to all their customers. This Digital Brochure utilizes Agent Shield’s patented technology to automatically personalize and brand this brochure for the referring agent. The CTA is: “Click here to get your own white labeled, personalized version of CorkscrewShoresDigital.com”. 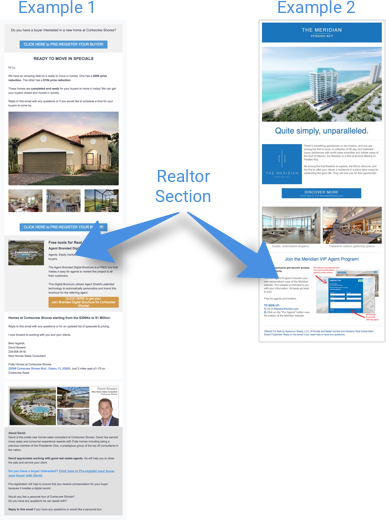 Example 2 is an email blast to Realtors announcing early access for Realtors. The VIP Agent Program includes your own personalized copy of the Meridian website. The website is branded to you with your information. All leads go back to you. Free for agents & Brokers. 1) Go to [enter website URL]. 2) Click on the “For Agents” button and follow the instructions. Example 3 is an email from onsite sales agents to Realtors telling them about how they can help the Realtors make more sales. Would you like to easily market Corkscrew Shores to all of your buyers and prospects? Would marketing materials branded to you help you make more sales? I want to help you make more sales. Here is a free co-broker marketing tool to help you promote our new homes and communities while giving you 100% control over your clients. CorkscrewShoresDigital.com is a website with valuable information for your buyers. The website will be branded with your name and info. The CorkscrewShoresDigital.com website will be automatically branded to you. 1) All contact information will be replaced with yours. 2) Leads will go directly to you. This is a free tool for you to use to help you make more sales. Get this free tool by going to https://corkscrewshoresdigital.com/for-agents/. I would love your feedback regarding the sign-up process and if you feel this tool is helpful in your business. The CTA is “Pre-register your buyer.” This has been a very effective tool.